Husky fans should be anxious about a certain mid-October game that might bring back memories of last year's loss at Arizona State. The Pac-12 solved the egregious scheduling issue that helped derail its playoff prospects last season. No team will play a Saturday road game followed by a Friday road game in 2018. But the conference hasn’t eliminated all the instances of competitive disadvantages. The Hotline took a deep dive into the 2018 schedules — they are ranked below, weakest to strongest — and found that the team with seemingly the best chance to reach the College Football Playoff has been dealt a dastardly assignment that doesn’t exist for playoff contenders in other conferences. Why in the world is Washington playing two conference road games in a row, with the back end being a trip to Oregon and the Ducks coming off a bye. In the Hotline’s humble opinion, that qualifies as a competitive disadvantage. For UW fans, the situation might feel alarmingly familiar. One of UW’s two losses last season came in Tempe, with Arizona State coming off a bye. In that case, at least, the Huskies had been at home the previous week. This time, they’re on the road: Washington visits UCLA on Oct. 6, then plays in Eugene on Oct. 13. The Ducks will have been off for 13 days. That isn’t the only instance of the back-to-back double whammy, either. Oregon State faces the same brutal assignment late in the season, playing at Stanford on Nov. 10 and then in Seattle on the 17th, with the Huskies coming off a bye. No offense to the Beavers, but the focus here is on UW because of its status as a potential playoff contender — and the potential for the conference to schedule itself out of the CFP for the second year in a row. It’s not fair to either the Beavers or Huskies, not even close to fair. We know this because of 1) common sense and 2) it doesn’t happen anywhere else. The Hotline reviewed the schedules for the top teams in the other Power Fives and found that none of them — not Alabama or Georgia or LSU, not Ohio State or Michigan or Wisconsin, not Oklahoma or Notre Dame, not Clemson or Florida State — has been assigned consecutive conference road games with the back end against a home team coming off 13 days rest. There’s a reason the other Power Fives don’t put teams in that position. Maybe the Pac-12 will get that issue resolved for 2019. Toughest stretch: Road back-to-backs against Utah (on a short week) and UCLA. Soft spot: The November lineups features, two home games, one bye and one roadtrip (Pullman). If the Wildcats somehow have a hold on first place when the month begins, they’ll be tough to overtake. Comment: No Washington, no Stanford, plus USC and Arizona State at home: Kevin Sumlin didn’t just inherit a good quarterback. Toughest stretch: The mid-Oct. duel with the Huskies is followed by trips to Pullman (trap game with WSU off a bye) and Tucson (just damn difficult). Soft spot: The first three weeks. Comment: The soft non-conference schedule stems from Texas A&M backing out of a series with the Ducks. Combine the noncon cupcakes with the USC miss and a bye before Washington, and the schedule sets up nicely for a run at the division. Toughest stretch: A Friday night roadie against USC — payback — followed by a visit from Utah form a difficult finish to the first half. Soft spot: The start, with those three highly-winnable noncons. Comment: The Cougars got treated right in that they avoid back-to-back road games. With seven at home and the manageable noncon lineup, the schedule is ideal for a team in rebuild mode. Toughest stretch: The Buffs visit USC and Washington back-to-back in early October. The trojans will be coming off a bye, and the Huskies will be glad to be home. Comment: Interesting extremes for CU, which has arguably the toughest back-to-back assignment in the conference (USC and UW on the road) but also is one of the greatest beneficiaries of the conference rotation. Toughest stretch: The mid-October turn brings a difficult four-game run with Washington, Washington State (road), USC (road) and Stanford. Soft spot: The noncon lineup is anything but daunting and culminates with a Week Four bye. Comment: The even-year division schedule is always home-friendly for the Bears, who welcome Washington, Oregon and Stanford to Berkeley. Toughest stretch: Week One seems fairly challenging, but we addressed the most difficult portion above. Soft spot: The stretch run. After a visit from Stanford on Nov. 3, the Huskies finish with a bye, Oregon State and the Apple Cup against their favorite punching bag. 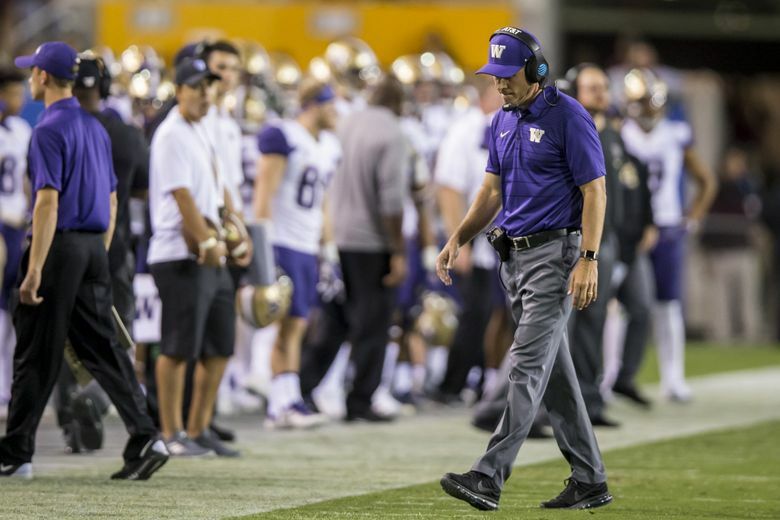 Comment: Considered slotting UW’s schedule in the top five due to Auburn and the Eugene assignment, but it’s otherwise manageable. The Huskies are missing two of the right teams to miss in the South. Toughest stretch: The September lineup is rugged with trips to Stanford and Texas (back-to-back) and then to Arizona. Soft spot: November is just mildly challenging with Oregon State, Cal and UCLA. Comment: Missing the Huskies and Ducks is a huge advantage for the Trojans in the division race. That said, no other team faces two Power Five non-conference opponents, and both the Irish and Longhorns are loaded with returning starters. Toughest stretch: The daunting September lineup features SDSU and USC at home — the Aztecs have won 22 games the past two seasons — and Notre Dame and Oregon on the road. Soft spot: Blink and you’ll miss it: The Cardinal gets WSU at home with extra time to prepare. Comment: The even-year schedule is always demanding with trips to Seattle, Eugene, Berkeley, Pasadena and South Bend. Only twice in seven years under David Shaw has the Cardinal been worse than 7-2 in conference play, and both instances came in even years (’14 and ’16). Toughest stretch: October begins and ends with back-to-back roadies, features two Friday nighters and includes Stanford and USC. Comment: As was the case in ’17, the cross-division rotation works against the Utes. Because of the returning personnel, they’re understandably viewed as a sleeper pick for the division. That status becomes a tad more difficult to justify when the schedule gets added to the equation. Toughest stretch: Three hours on Saturday, Sept. 1. Soft spot: The Beavers host WSU and Cal in October, with a bye in between. Comment: Brutal as the Week One assignment might be, the Beavers have a November that approaches ridiculous. In succession, they face USC, Stanford (road), Washington (road) and Oregon — quite possibly the four best teams in the conference. The combination of start and finish is the reason for OSU’s placement. Toughest stretch: November starts with trips to Eugene and Tempe and ends with USC and Stanford at home. Good luck with that. Soft spot: The bye week. Comment: The Bruins are missing the North teams they would prefer to play, have a trap game with Fresno State and get their bye a few weeks too early (9/22). When I consider the challenges within UCLA’s schedule, the trip to Norman isn’t even in the top three. Toughest stretch: September is brutal with back-to-back-to-backs against Michigan State, San Diego State (road) and Washington (road). Soft spot: Starting in late September, the Devils face Oregon State (home), then Colorado (road), then have a bye. Comment: I picked the September triple-whammy as the toughest stretch, but the final six weeks are unforgiving, too. In every regard, the schedule staring back at Herm Edwards is the antithesis of what awaits Kevin Sumlin.